This is a little extra post for you. Last Friday was a lovely day so I just had to ride around a bit. I didn’t bring my camera as I wasn’t expecting to film anything. 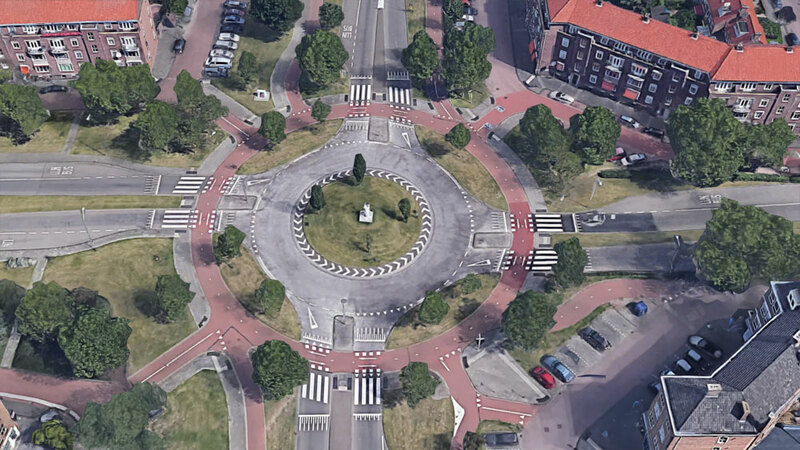 But then when I took a left turn on a roundabout in my hometown of ʼs-Hertogenbosch and saw the lovely flowers in all the traffic islands I thought that that was quite photogenic. So I went back and repeated that left turn filming it on my phone. 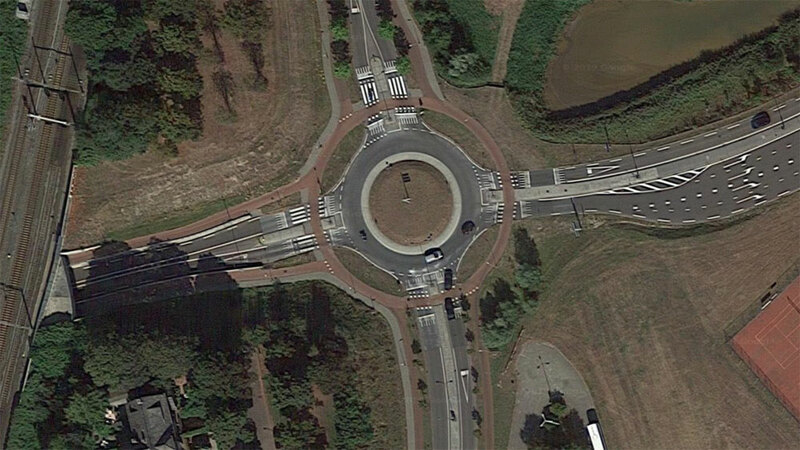 The third roundabout I filmed is two-way for cycling so I decided to go clockwise, “against” traffic. I filmed four roundabouts. The first three I cycled, the fourth I observed. When I put the clip on Twitter it almost exploded. That is so weird, because it literally only took me one minute, filming this in one take. The older gentleman in front of me was the perfect person to ride behind. He even indicated where he was going and had an encounter with a pedestrian. It almost looks staged, as someone commented, but it definitely wasn’t. Some didn’t believe this is a main road. One even called refering to it as a major arterial “disingenuous at best“. 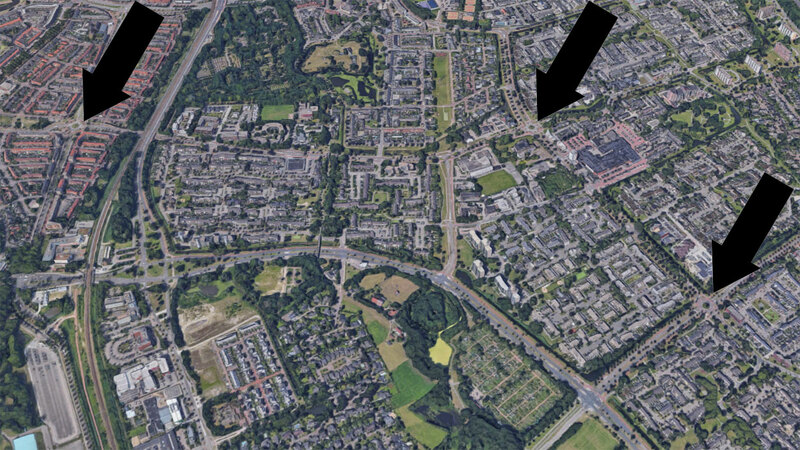 The road used to be 4-lanes for cars until 2013, but some municipalities in the Netherlands (by coincidence including ‘s-Hertogenbosch where I live and Utrecht where I work and come from) feel that 4-lane roads should no longer be the norm. And that makes that major arterials no longer look the part in foreign eyes. While I rode home I encountered two more roundabouts and thought “why not film those too”. In those cases I even filmed the first and only time I rode across them. This was just a spontaneous act. Because these clips went viral people wanted to link to them from Facebook. I therefore made the below video where I just put in all the clips to make one video. 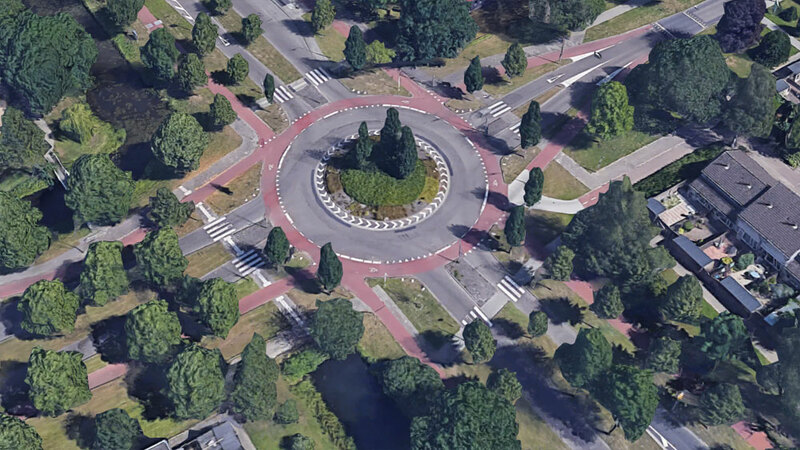 Since people were speculating that this looked far out-of-town in suburbs I also included Google aerial pictures to show that these roundabouts are actually in the middle of my hometown. Okay they’re not in the historic city centre but they’re also not so suburban as some seemed to think. Another look at how urban the area really is where you can find the first three roundabouts. (Picture Google Maps 3D) (North is right here). I was considering to film roundabouts with my 360-camera soon. So you can see much more of the interactions with cars that are a bit out of sight now. But that is for another time and then I will write a proper blog post. If you hadn’t seen the clips on Twitter yet, enjoy the video! 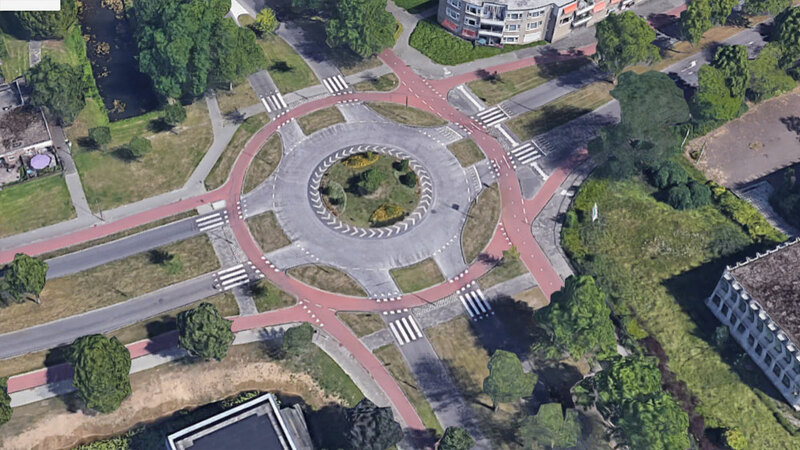 Some left turns on a few random roundabouts in ʼs-Hertogenbosch. Nice wide, attractive, separated bicycle paths. I think I read somewhere that it is done on purpose to make bicycling highly enjoyable. This encourages lots of people to use the infrastructure. This is probably the best idea I have ever heard of to make society happier. 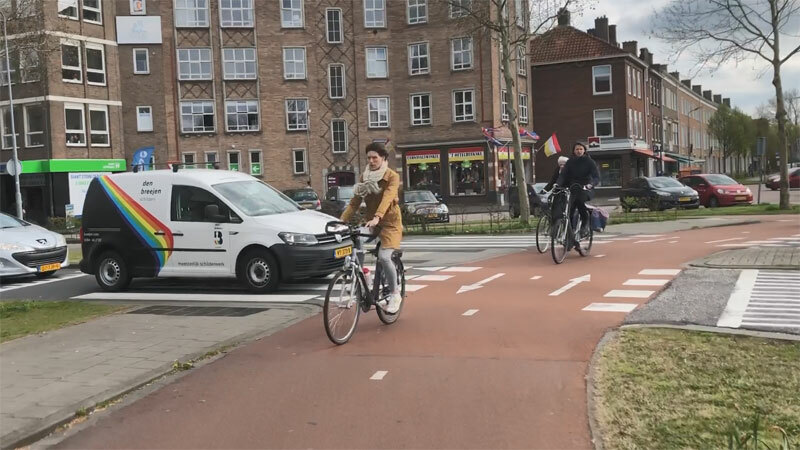 This entry was posted on 9 April 2019 by Bicycle Dutch in Original posts and tagged ’s-Hertogenbosch (Den Bosch), ride, roundabout.